With bags still to unpack and memories to sort, we’re in the midst of reentry from our travels in Puglia. Next to jet lag, the biggest adjustment on returning home has been to the difference in what’s now in season. The eggplant, zucchini and basil we’d become accustomed to feasting on while there won’t be available again for a good while. 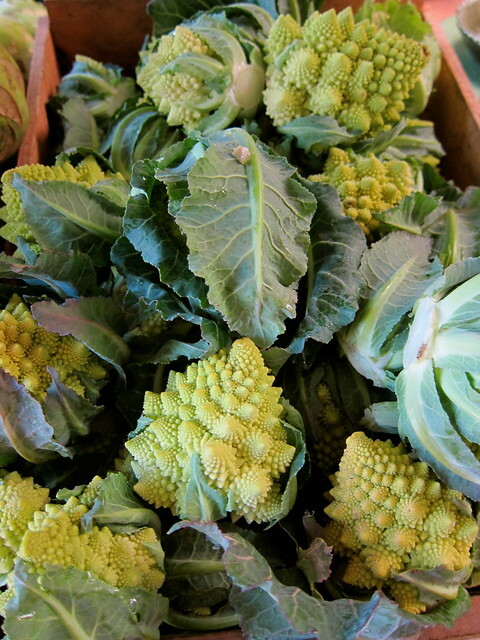 Finding Romanesco cauliflower at this week’s Exeter Farmers’ Market, however, quickly transported us back. While smaller than their Italian brethren, Heron Pond Farm had these beguiling celadon-colored beauties on offer. Knowing that pasta was on the evening’s menu, we hungrily snatched up a bulging bagful and eagerly set about recreating some of the flavors we left behind. This is another recipe adapted from the ever-reliable Olives & Oranges. Though not entirely of Italian origin, the selection of pasta recipes contained within could keep one happily fed for a lifetime. Other varieties of cauliflower are easily substituted for the Romanesco, which usually appears in fall into winter. It has a nutty flavor, and holds up well in roasting. We like using green olives for the brightness they add, in contrast with the saline capers and anchovies. Use salt-packed capers if you can find them, they’ll taste more of capers than the brined ones. For a vegan variation, feel free to skip the parmesan and anchovies. The toasted breadcrumbs are a traditional Southern Italian garnish that usually takes the place of cheese, and, especially when homemade from good bread, can stand on their own in this rustic dish. – Heat oven to 400°F with rack in center. Line a baking sheet with parchment paper. Toss cauliflower with 2 tablespoons olive oil, and season with salt and pepper. Spread on baking sheet and roast, stirring midway through as needed, until tender and beginning to brown, about 30 to 45 minutes. Remove from oven and let cool. – Heat remaining ¼ cup oil in large frying pan. Add garlic and pepper flakes, and cook until garlic begins to color. Add olives and capers, and cook for a minute or two more. Add anchovies, stirring until dissolved. Add roasted cauliflower, mix well, then remove from heat. – Cook pasta in salted water until al dente. Drain and toss into the pan with the cauliflower. Mix in the cheese and half of the parsley, then the breadcrumbs last. Garnish with the remaining parsley and a drizzle of really good olive oil, and serve with additional cheese on the side. Recipe adapted from “Olives & Oranges” by Sara Jenkins and Mindy Fox. Local ingredients: Romanesco cauliflower from Heron Pond Farm; garlic from the garden. 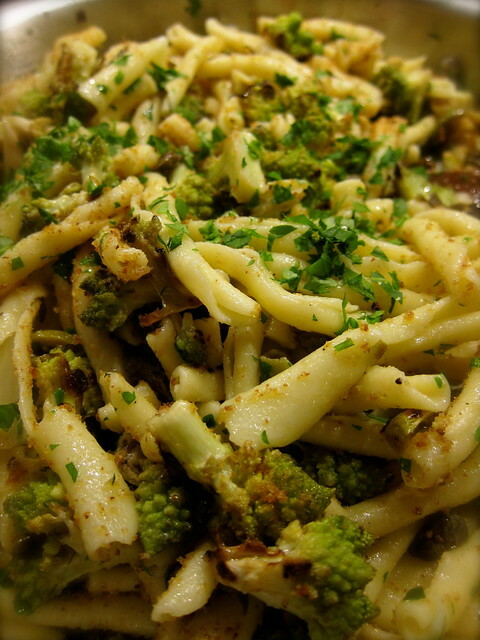 This entry was posted in cooking and tagged capers, cauliflower, garlic, olives, pasta. Bookmark the permalink. 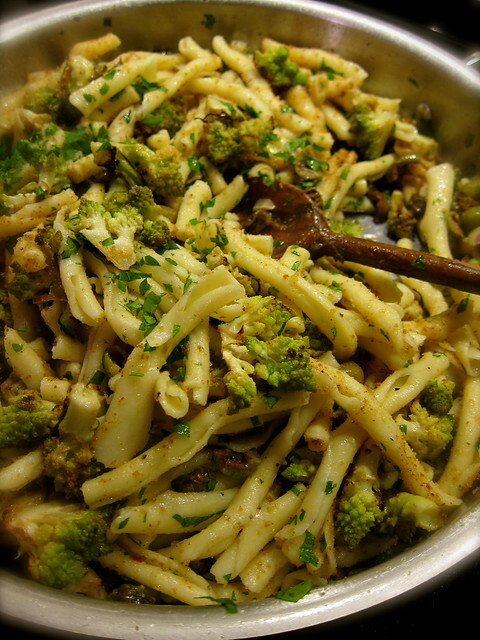 Yum, I make versions of this with both broccoli and cauliflower but haven’t tried it with Romanesco – looks great. Beautiful pasta! And you gave me a suggestion of what shape I should tackle next: it will be strozzapreti.